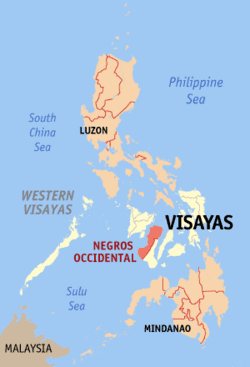 Negros Occidental (Hiligaynon: Negros Nakatundan; Cebuano: Kasadpang Negros; Filipino: Kanlurang Negros), also known as Occidental Negros or Western Negros, is a province located in the region of Western Visayas, in the Philippines. It occupies the northwestern half of the large island of Negros, with Negros Oriental comprising the southeastern half. Known as the "Sugarbowl of the Philippines", Negros Occidental produces more than half the nation's sugar output. Negros was originally known to the natives as "Buglas", meaning "cut off" in old Hiligaynon. When the Spaniards arrived in April 1565, they named it "Negros" because of the dark-skinned natives they found. Two of the earliest native settlements were Binalbagan and Ilog which later became towns in 1572 and 1584, respectively. Other settlements were Hinigaran, Bago, Marayo (now Pontevedra), Mamalan (now Himamaylan) and Candaguit (now a sitio of San Enrique). Ilog was made the first capital of the province in 1743. This was later transferred to Himamaylan. Bacolod finally became the capital in 1849. The island was divided into Negros Occidental and Negros Oriental in 1890. The two provinces were briefly united as an independent Republic of Negros with Bacolod as the capital on November 27, 1898. It became a protectorate of the United States until 1901, when the republic was dissolved, with the two provinces annexed back to the Philippines. During the succeeding decades between 1901 and the 1930s, Negros Occidental and Negros Oriental were both under Insular Government of the United States of America as with the rest of the nation and later under the Government of the Commonwealth of the Philippines. Economic growth continued especially with Philippine sugar having a part of the US market. The socio-economic lives of the island of Negros, from the 1950s up to the late 1980s, depended as before, mainly on the sugar industry. During World War II, both Negros provinces were invaded by Imperial Japanese forces, resorting many residents to flee to the inland mountains. Negros Island was liberated by combined Philippine & American troops with the local Negrense guerillas attacking the Japanese on August 6, 1945. The 7th, 73rd, 74th and 75th Infantry Divisions of the Philippine Commonwealth Army were established from January 3, 1942 to June 30, 1946 and the 7th Infantry Regiment of the Philippine Constabulary was active from October 28, 1944 to June 30, 1946 at the Military General Headquarters in Negros Occidental. They started the engagements of the Anti-Japanese Imperial Military Operations in Negros from 1942 to 1945 against the Japanese Imperial forces. Global sugar prices dropped during the 1970s and 1980s, which negatively impacted the production of sugar in the island. Quality of life and sugar production were intertwined, so lower production meant lower quality of life for thousands that relied on the industry for sustenance and financial stability. The province saw a dangerous spike in the percentage of malnourished infants which was as high as 78%. Negros Occidental's problem on malnourished infants gained global prominence among the press in 1985, as they ran covers on both, local and international newspapers. During the 1970s and 1980s, atrocities against peasants were committed, with one such harrowing example being the Escalante Massacre. Negros del Norte was created from Negros Occidental on January 3, 1986, but its creation was declared unconstitutional on July 11, 1986, and was immediately abolished on August 18, 1986. Towards the end of 1987, after the successful overthrow of the Marcos regime, the overall economic situation started to show a positive upturn. The campaign for agricultural diversification had been gaining momentum, paving the way for more landowners to invest in prawn and fish farming, seafood catching, raising of livestock and high-value organic produce such as fruits and vegetables, as well as other cash crops. Investments' upswing became apparent by 1988. The participation of the industrial sector accelerated the consumer-led economic growth and development manifested with the increase in sales of consumer goods and by-products. Today, Negros Occidental remains one of the most progressive and largely developed Philippine provinces, in large due to the profits from the sugar industry, but also due to economic diversification in other fields. In May 29 of 2015, Negros Island Region was formed when Negros Occidental and its capital was separated from Western Visayas and transferred to the new region along with Negros Oriental, when President Benigno Aquino III signed Executive Order No. 183, s. 2015. But it was abolished on August 9, 2017 when President Rodrigo Duterte revoked Executive Order No. 183, s. 2015 through the signage of Executive Order No. 38, citing the reason of the lack of funds to fully establish the NIR according to Benjamin Diokno, the Secretary of Budget and Management, reverting Negros Occidental back into Western Visayas. Most residents are of either pure or mixed Austronesian heritage, while the minority have foreign/mixed ancestry (i.e. Chinese or Spanish). Residents of Negros are called "Negrenses" (or less often "Negrosanons"). 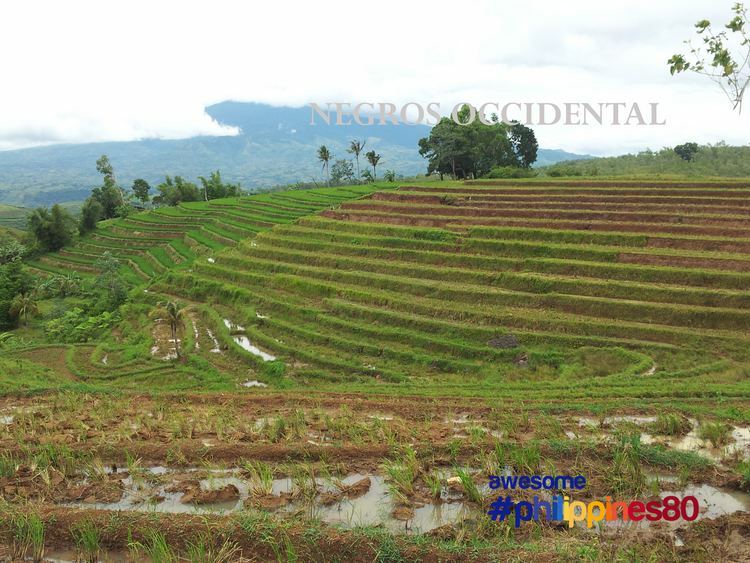 Negros Occidental is predominantly a Hiligaynon-speaking province by 84%, because of its linguistic ties with Iloilo. However, cities and towns facing the Tañon Strait are Cebuano-speaking by only 16%, due to their proximity to the island-province of Cebu. Sagay City and surrounding places, which are facing both Iloilo and Cebu, speaks a hybrid language composed of Hiligaynon and Cebuano. Filipino and English, though seldom used, are widely spoken and used on both sides of the island for educational, literary and official purposes. Negros Occidental is the second most-populous province in the Visayas after Cebu, having the second largest number of congressional districts and the 7th most-populous (4th if highly urbanized cities and independent component cities are included in the population of corresponding provinces) in the Philippines based on the 2015 Census. As of 2010, the population of registered voters are 1,478,260. Christianity is the predominant religion in the province with Roman Catholicism as the largest singular denomination by 85.71% (The Roman Catholic Dioceses of Bacolod, San Carlos & Kabankalan) of the population. The remaining Christian faiths are usually divided by various Protestant faiths such Aglipayan Church with 10% of the population making it the second largest Christian group in the province, the Iglesia Ni Cristo and Members Church of God International also having a significant presence, while Baptist, Methodist, Church of Christ of Latter Day saints (Mormons), Jehovah's Witnesses, Seventh-Day Adventist and other Evangelical Christians are also present in the province in a minor percentage. The rest of the non-Christian population are adherents of Islam and Buddhism. Negros Occidental has long been a center of culture and arts; the wealth brought about by the sugar industry made sure that the Negrense principalía enjoyed an above-average standard of living. Silay City, to the north of the capital of Bacolod City, nicknamed the "Paris of Negros", is the cultural and artistic center of Negros Island Region. It has 30 heritage houses declared by the national historical institute, most notable of which is Balay Negrense; it is also the hometown of National Artist of the Philippines for Architecture Leandro Locsin and international mezzo-soprano Conchita Gaston. This blossoming in art was due to the economical importance of the area during the Spanish era, Negros became probably the most hispanized and pro-Spanish area, due to the enormous investments of Spain in the sugar business. Another famous treasure of Negrense art heritage can be found in Victorias City, within the confines of the Victorias Milling Company in its chapel is the world-famous mural of the Angry Christ, painted by artist Alfonso Ossorio, a scion of the Ossorio family who owned the mill. The Negrenses' joie de vivre is manifest in the various festivals all over the province, foremost being the famous MassKara Festival of Bacolod, Pasalamat Festival of La Carlota, Bailes de Luces of La Castellana and Pintaflores Festival of San Carlos. These and other local festivals are featured during the Pana-ad sa Negros Festival staged every April at the 25-hectare tree-lined Panaad Stadium in Bacolod City. Dubbed as the "Festival of Festivals", Pana-ad brings together the 13 cities and 19 towns in a showcase of history, arts and culture, tourism, trade, commerce and industry, beauty and talent as well as games and sports. Negros Occidental is rich in structures and buildings that are remnants of a once affluent lifestyle. The Palacio Episcopal (1930), San Sebastian Cathedral (1876), and the Capitol Building (1931) are popular landmarks. In most towns, steam locomotives that used to cart sugarcane from the fields to refineries attract steam-engine enthusiasts from all over the world. There are also impressive churches all over the province, both built recently and during the Spanish era. Modern communication facilities, as well as radio, television and newspapers, are available in the province. Most are provided by dominant national players in the industry like PLDT, Globe Telecom and their subsidiaries. For television and radio, the major providers are network giants ABS-CBN, GMA, TV5 and CNN. Cable TV provides access to BBC, ESPN and other international programs. National and international newspapers are available on the same day of issue in Manila. Bacolod City is noted for being the home of the Negros Summer Workshops, founded by multi-award-winning filmmaker and Negrense Peque Gallaga. Founded in 1991, Workshops has long been training students from different parts of the country who wish to learn courses in film-making, acting, writing, and more. Some of its alumni include actors in mainstream Philippine show business. 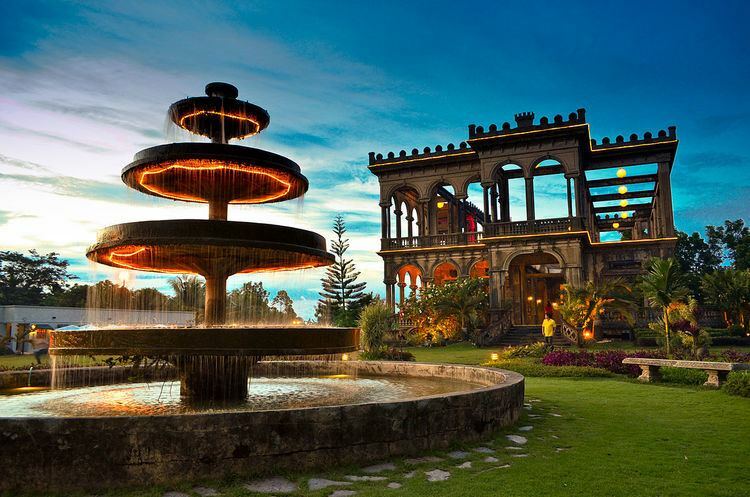 Negros Occidental has also been used as a setting and location shoot for various films and television shows, most notable of which is the 1981 epic Oro, Plata, Mata where Hacienda Rosalia is the setting. Recent films that were set and filmed in Negros are Ligaw Liham (2007), Namets! (2008), and Everyday I Love You (2015). There is one regional newscast program in Bacolod: TV Patrol Negros (ABS-CBN Bacolod). Negros Occidental has produced a large number of athletes that have achieved success in both national and international circuits. The province is also well known for hosting national and international athletic events, which has given it a reputation as the sports capital of the Philippines. Negros Occidental has a long, entrenched history when it comes to football. The first ever Filipino to play in the European football circuit was Bacolod-born Manuel Amechazurra, who joined FC Barcelona from 1905 to 1915. The Panaad Stadium in Bacolod City has been a venue for national and international athletic events; such as the 23rd Southeast Asian Games men's football and the 2006 ASEAN football qualifiers. On February 9, 2011, the stadium hosted a match between the Philippines national football team and Mongolia in the 2012 AFC Challenge Cup qualification with an attendance of 20,000 people. Bacolod City has been christened as a Philippine "football city" for its patronage of the sport in the country. A few members of the Philippine football team are from Negros: most notable is goalkeeper Eduard Sacapaño, a native of Bago City; Tating Pasilan and Jinggoy Valmayor of San Carlos City; and ace striker Joshua Beloya of Bacolod. Negros Occidental has its own football association: Negros Occidental F.A. It works under the Philippine Football Federation as provincial football association for the Negros Occidental area. The Negros Occidental FA sends a team to represent the region in the yearly PFF National Men's Open Championship and PFF National Women's Open Championship. In the 2011 season of the PFF Suzuki Cup U-23 National Championship, the Negros team were crowned as champions where they defeated their fierce football rival Iloilo (IFA) in the finals. Negros Occidental is also home of the 2013 PFF National Men's Club Champions, Ceres F.C., who represented the province in the said tournament. They battled UFL Cup Champions Stallion in the Round of 16 and won 1–0. They battled 2012 UFL Champions Global in the quarterfinals and also won 1–0. In the semifinals, Ceres FC topped Kaya with 3–1 scoreline to enter finals of 2013 PFF National Men's Club Championship. Ceres FC eventually won the 2013 PFF National Men's Club Championship trophy after they beaten the other finalist PSG with 1–0 score. Aside from hosting sporting events Negros Occidental has produced many of the nation's finest athletes, particularly in boxing. The likes of 1923 World Flyweight boxing champion, Francisco Guilledo a.k.a. Pancho Villa, current WBO minimum weight champion Donnie Nietes, 1970's WBA world junior lightweight champion Ben Villaflor, all hail from Negros Occidental. It is also notable for producing Olympiads, Silver Medalist Mansueto Velasco in the 1996 Summer Olympics, his brother Roel Velasco who in turn won a bronze medal in the 1992 Summer Olympics. Bacolod City has two major golf courses. These are the Bacolod Golf and Country Club and the Negros Occidental Golf and Country Club. The city hosted the 61st Philippine Airlines Inter-club Golf Tournament and the 2008 Philippine Amateur Golf Championship. Bacolod City hosted two major karatedo championships, the 1996 Philippine Karatedo Federation National Championship and the 2007 20th PKF National Open. Both tournaments were held at the La Salle Coliseum of USLS. The tournaments were participated by hundreds of karatedo practitioners all over the country. Bacolod City and its neighboring cities and towns are home to many mixed martial arts competitions including quarterly fights hosted by the Universal Reality Combat Championship (URCC). Known as the "Sugarbowl of the Philippines", the sugar industry is the lifeblood of the economy of Negros Occidental, producing more than half of the country's sugar. There are 15 sugar centrals located throughout the lowland areas the north and west of the island, stretching from northwest along the coasts of the Visayan Sea and Guimaras Strait. Among the larger mills are in San Carlos, La Carlota, Bago, Binalbagan, Kabankalan, Sagay, Silay, Murcia and Victorias. Victorias Mill in Victorias City is the largest sugar mill in the country, and the world's largest integrated sugar mill and refinery. Sugar is transported from plantations to refineries by large trucks that use the national highway. A fishing industry is found in Cadiz City, and other fishponds that dot the province. One of the country's largest copper mines is located in Sipalay City. There also exists a cottage industry which produced handicrafts made from indigenous materials. It is also the Business Process Outsourcing (BPO) hub of the Negros Island Region of the Philippines. Among the notable BPO companies operating in the city are Convergys, Teleperformance, TeleTech, Focus Direct International, Inc. – Bacolod, Panasiatic Solutions, Ubiquity Global Services, Transcom Asia and iQor. In 2012, a two-hectare portion of the four-hectare Paglaum Sports Complex was partitioned for the construction of the provincial government-owned Negros First CyberCentre (NFCC) as an IT-BPO Outsourcing Hub with a budget of P674-million. It is located at Lacson corner Hernaez Streets in Bacolod City and offers up to 22,000 square meters of mixed IT-BPO and commercial spaces. Its facilities are divided into three sections — Information Technology, Commercial Support Facilities, and Common IT Facilities. It was inaugurated in April 2015 in rites led by President Benigno S. Aquino III. The area was initially a residential zone and has been reclassified as a commercial zone as approved by the Comprehensive Zoning Ordinance. By 2014, Negros Occidental is the province with the highest income in all of the Philippines, earning an average of P3.332 billion. On January 18, 2008, the new airport was inaugurated in Silay City, 16 kilometers north of Bacolod. The new airport replaced the Bacolod City Domestic Airport. The new airport runway is of international standards and was constructed to facilitate future landings of international flights to serve the growing number of tourists visiting Negros Occidental each year. A new airport designed to serve the general area of Kabankalan City. The airport would be the second airport in Negros Occidental, after the Bacolod-Silay International Airport and the third airport on Negros Island Region. It is located four kilometers northeast of Kabankalan City proper on a 100-hectare site in Barangay Hilamonan. Completion of the airport is still undergoing. On August 3, 2017, Air Juan started to open flights to Sipalay City from Cebu and Iloilo. Flights from Cebu to Sipalay will be every Wednesday while Sipalay to Cebu on Sundays; Iloilo to Sipalay on Mondays and return on Thursdays. Sipalay Mayor Oscar C. Montilla, Jr. had been looking forward to having an airline company operate in the city to boost tourism. The small Sipalay airport with a 1,400-meter runway is located in a 10-hectare property of the local government. Negros Occidental Governor Alfredo G. Marañon, Jr. has committed to support the planned concreting of the runway. All cities and municipalities are linked by an extensive road and bridge network stretching more than 1,500 kilometers crisscrossing the province with seven alternative scenic routes to the nearby province of Negros Oriental. Within the province, travel is also easy, comfortable and even enjoyable with air-conditioned and non-aircon buses or metered taxis. Car rental services are also available. However, the jeepney is still the most common means of transport among the towns and cities. For accommodations, visitors may choose from a wide range of about 67 hotels, pension and lodging houses and tourist inns. The better known hotels are L’ Fisher, Bacolod Convention Plaza, Pagcor Hotel, and Business Inn, Sugarland Hotel, all in Bacolod City. The province has adequate power and water supplies. It is currently interconnected to the Visayas Power Grid whose main sources of power are geothermal. Aside from its existing 170 megawatts capacity, Negros Island by the year 2006 has an additional 105 megawatts of locally produced power from geothermal plants in Bago City and in barangay Palinpinon, Valencia, Negros Oriental, and from bagasse co-generation facility of First Farmers Sugar Mill. Ample water supply for household, commercial, industrial and agricultural uses is assured by 73 thousand hectares of proclaimed and protected major watersheds, regular rainfall and six major river systems. International direct dialing, fiber optic data lines and internet services are accessible in most areas of the province. Also, GSM, digital and analog cellular networks provide good coverage in Bacolod City and other areas, including international roaming. The medical and health care needs of the people of Negros Occidental and its guests are presently being met by 20 government hospitals and 10 private hospitals, as well as several city and municipal health centers, barangay health stations and day-care centers. Doctors, nurses and other medical personnel serving these facilities are not only competent but also very caring towards their patients. Banking and finance is likewise a thriving industry in Negros Occidental. According to the latest count, there are 389 financial institutions competing for businesses in the province. 149 of these are banks. 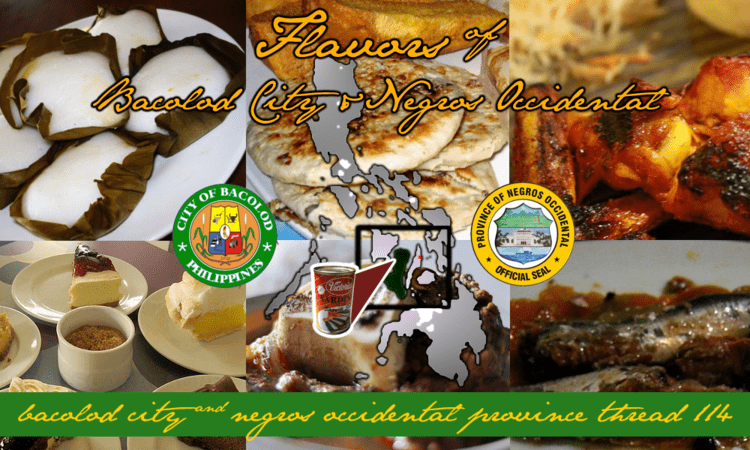 Negros Occidental offers several advantages for those who are doing business in the province. It is strategically located near Metro Manila, Metro Cebu and Metro Davao, all major international gateways with maximum travel time of only about 4 hours between the Philippines and its neighbors in Southeast Asia. It is equipped with major infrastructure facilities for easy travel and shipment of goods within and outside of Negros. The Panaad Park and Stadium is a multi-purpose stadium in the province. It is currently used mostly for football matches, and was used for the 2005 South East Asian Games. It was the venue of the pre-qualifiers of the 2007 ASEAN Football Championship or ASEAN Cup, in which the Philippines, Cambodia, Timor Leste, Brunei and Laos participated. The stadium has a seating capacity of 15,500, but holds around 20,000 people with standing areas. It is unofficially designated as the home stadium of the Philippines national football team. Aside from the association football field, it also has a rubberized track oval, an Olympic-size swimming pool and other sports facilities. The stadium is also the home of Panaad sa Negros Festival, a week-long celebration participated in by all cities and municipalities in the province held annually every summer. The festival is highlighted by merry-making and field demonstrations at the stadium. The stadium itself features replicas of the landmarks of the 13 cities and municipalities of Negros Occidental. The Capitol Park and Lagoon is a provincial park located right in the heart of Bacolod City, Negros Occidental, in the Philippines. One of the landmarks of the park is the statue of a carabao (water buffalo) being pulled by a woman. This statue is located at the northern end of the lagoon. On the other end, there is also another carabao sculpture but the figure is being pulled by a man. Local everyday activities in the park include jogging, aerobics, school dance rehearsals, promenaders, arnisadors, and martial arts practitioners. The Fountain of Justice is a historic landmark in Bacolod City, Negros Occidental, Philippines. It marks the location where the house of Jose Ruiz de Luzurriaga used to stand. It was in this house that the surrender of Bacolod by Spanish authorities to the Filipino forces of General Aniceto Lacson took place on November 6, 1898, during the Negros Revolution. The Bacolod Public Plaza is one of the notable landmarks of Bacolod City, the capital of Negros Occidental, Philippines. It is located in the heart of the downtown area, near the city hall and across from the San Sebastian Cathedral. The plaza is a trapezoidal park with a belt of trees around the periphery and a gazebo at the center. Scattered within the trees are four circular fountains. The plaza was constructed in 1927 as a place for recreation, political, spiritual and cultural activities. It is quite a popular site for outdoor picnics and concerts. The gazebo is often used to house a bandstand. The Balay Negrense was originally the ancestral house of Victor F. Gaston, a son of Yves Leopold Germain Gaston and Prudencia Fernandez. The elder Gaston is credited as one of the pioneers of sugarcane cultivation in this portion of the Philippine archipelago. A native of Normandy in France, he married a Filipina from Batangas where he initially began experimenting with sugar production before relocating to Negros. Built in 1897, the structure housed Victor Gaston and his twelve children from 1901 until his death in 1927. Left unused by the family, the structure was abandoned in the mid-1970s and fell into disrepair until a group of concerned Negrenses formed what would later become the Negros Cultural Foundation and managed to acquire the house from the heirs of Gaston through a donation. With donations from prominent individuals and later the Department of Tourism, the structure was repaired and furnished with period furniture and fixtures. The museum was officially inaugurated on October 6, 1990. The Mariano Ramos Ancestral House is the home of the late Don Mariano V. Ramos, the son of Agaton Ramos and Dolores Varela, was the first appointed Presidente Municipal of Bacolod City, Philippines. It was built in the 1930s and its architecture is a combination of Castilian and Tuscan and has three storeys, including the tower room, known as the torre. During World War II, Don Mariano's Ancestral house was the most prominent structure with a view over the whole city. The commanding Japanese general was disguised as a family gardener. As the war broke, the Japanese seized the Mariano Ramos Ancestral house in order to use it as a watchtower and as a headquarters. The San Diego Pro-cathedral, formerly known as the San Diego Parish Church or the St. Didacus Parish Church before its declaration as a pro-cathedral in 1994, is an early 20th-century church in Silay City, Negros Occidental in the Philippines. It is the only pro-cathedral outside of the national capital of Manila, and is unique in Negros Occidental for being the only church in the province featuring a cupola or dome. The mansion dates back to the 1900s when it was built by sugar baron Don Mariano Ledesma Lacson for his first wife, Maria Braga, a Portuguese from Macau whom he met in his vacations in Hong Kong. The mansion's structure is of Italianate architecture enhanced by a belvedere complete with renaissance-type balustrading typical of the homes of English ship captains. It was burned down in World War II to prevent the Japanese from using it. It was opened to the public by descendants of the original owner and is listed as among the World's 12 most fascinating ruins. The Negros Occidental Multi-Purpose Activity Center (NOMPAC) is a provincial-owned multi-use gym located in Bacolod City, adjacent to the Capitol Park and Lagoon. It is currently used mostly for basketball, karatedo and boxing matches. Aside from the gym, it also serves as evacuation site of the city and province during disasters and likewise also serves as cultural facilities in many events and celebrations. There are 1,318 schools in the province; 53 are registered technical schools including the Technological University of the Philippines – Visayas and Carlos Hilado Memorial State College in Talisay City. Of these, 158 are private schools, including University of Saint La Salle, STI West Negros University, Colegio San Agustin - Bacolod, La Consolacion College - Bacolod, VMA Global College, University of Negros Occidental - Recoletos, Central Philippines State University, Philippine Normal University – Visayas and Central Philippine Adventist College. Negros Occidental's output of more than 1 million metric tons for crop year 2002–2003 accounts for nearly half of the country's sugar production in an industry that generates an estimated annual revenue of more than ₱18 billion. There are 12 sugar mills in the province, of which only 10 are presently operational. Victorias Milling Company has the highest rated capacity with 15,000 tonnes cane per day. However, the volatility of the sugar industry forced the province to shift, albeit slowly, to other high-value crops and alternative industries. The diversification has proven to be highly successful. Production of rice, the basic commodity for food security, has been increasing. By 2003, annual output of 437 thousand metric tons of palay was 33% better than two years ago. This allowed the province to significantly raise its sufficiency level from 65% to more than 84%. The improvement could be attributed to the introduction and promotion of hybrid rice, which increased rice yields to 3.8 metric tons per hectare. Because of the success of the program, area planted to hybrid rice has increased nearly fivefold. The highest hybrid yield was recorded at 10.3 tons per hectare. Corn also registered increasing gains. Production for 2003 of 42 thousand metric tons outperformed 2001 output by 18%. Average yield per hectare has also grown by 18%. Other fruit and vegetable crops, except for banana and cassava, likewise improved their harvest. Harvested coconut was placed at 139 million nuts, while production of banana; fruit and vegetable crops totaled 110 million kilograms. Livestock and poultry are industries where Negros Occidental has strongly diversified. With the province successfully quarantined from the foot and mouth disease and bird flu, as well as with other endemic diseases under control, total production of livestock and poultry in 2003 of 49 thousand metric tons exceeded estimated local demand by 18%. Fishing is likewise an industry where the province has remained focused. After all, 9 of its cities and 16 of its municipalities are located along the coastline and a great portion of the population depends on fishing for their livelihood. The area for exploitation by this industry is huge, covering most of the coastal areas and the rich fishing grounds of the Visayan Sea on the north, Sulu Sea on the south, Tañon Strait on the east and Guimaras Strait and Panay Gulf at the west. These rich coastal areas and fishing grounds continue to be generous to the people of Negros Occidental. In 2003, products from deep-sea fishing, municipal marine and inland waters, and aquaculture reached 87 thousand metric tons, 30% better than 2001 production. The province is rich in mineral deposits. Minerals that abound in the province are primary copper with estimated reserve of 591 million metric tons and gold ore with estimated reserve of 25 million tons. Silver and molybdenum deposits are also abundant, as well as non-metallic minerals suitable for agricultural and industrial uses. Notwithstanding its great potential, the mining industry in Negros Occidental has remained virtually dormant since the biggest copper mine in Sipalay suspended its operation in the year 2000. Negros Occidental comprises 19 municipalities and 13 cities, further subdivided into 662 barangays. It has the most chartered cities among all the provinces in the Philippines. Although Bacolod City serves as the capital, it is governed independently from the province as a highly urbanized city.